Here are the 2013 Genesis Finalists. 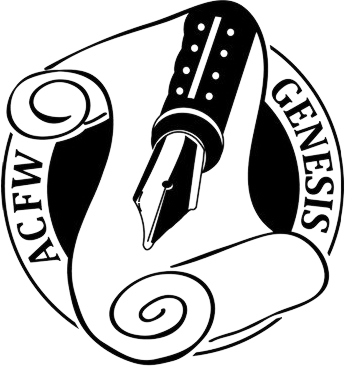 The winners will be announced during the 2013 ACFW National Conference in Indianapolis at the Gala on September 15, 2013. June 2013 ACFW New Releases! A Bride for All Seasons by Robin Lee Hatcher, Margaret Brownley, Debra Clopton, and Mary Connealy — 1800s mail-order bride catalogs facilitated many happy marriages. Here are the stories of four couples who owe their wedded bliss to creative editing by The Hitching Post publisher. (Historical Romance Novella from Thomas Nelson). Pieces of the Heart: Quilts of Love Series by Bonnie S. Calhoun — Cordelia Grace watched Bernard Howard, the love of her young life, go off to fight for our country in WWII. And she has spent the last three years creating the Pine Cone quilt that will grace their marriage bed when he comes home. Her image of their “happy-ever-after” grows proportionally as the quilt expands. But is the man that returns from the war, the same man that she remembered? Are the dark shades of color that she had to use for the outside edges of the beloved quilt prophetic of her life to come? (Historical Romance from Abingdon Press). Stealing the Preacher by Karen Witemeyer — Abducted from a train by a gang of aging outlaws, Crockett Archer must choose between either escaping to follow his own dreams or staying to help the daughter of his captor fulfill hers. (Historical Romance from Bethany House). Blowing on Dandelions by Miralee Ferrell — In 1880, three years after Katherine Galloway’s husband’s death, she struggles to run an Oregon boardinghouse and raise two girls alone. Things don’t get easier when her critical, domineering mother moves in. And with a daughter entering the teenage years, the pressure on Katherine becomes close to overwhelming. Then she crosses paths with Micah Jacobs, a widower who could reignite her heart. (Historical Romance from David C. Cook). Trouble in Store by Carol Cox — Fired from her most recent governess position, Melanie Ross must embrace her last resort: the Arizona mercantile she inherited from her cousin. But Caleb Nelson is positive he inherited the mercantile, and he’s not about to let an obstinate woman with newfangled ideas ruin all he’s worked for. Stolen Identity by Lisa Harris — Danielle Corbit doesn’t understand why someone would want to steal her identity. But after discovering a dead body on the Oregon coastline she’s attacked by a dangerous hacker who will stop at nothing to frame her. Only her former fiance, Jason Ryan, is willing to help. (Romantic Suspense from Love Inspired). Plain Pursuit by Alison Stone When her brother is killed in a small Amish town, Anna Quinn discovers she’s an unwelcome outsider. But the FBI agent investigating the case is right at home–because Eli Miller was born and raised in Apple Creek’s Plain community. Eli left his Amish faith behind long ago, but his heart is rooted in a local cold case he can’t forget–a mystery with strange connections to Anna’s loss. Desperate to uncover the truth, Anna and Eli are faced with stony silences and secrets…secrets that someone wants to keep buried in the past. (Romantic Suspense from Love Inspired). The Good Girl by Christy Barritt — The only time Tara Lancaster missed church was at seventeen because she had pneumonia and her mom made her stay home. But when her life shatters around her and her reputation is left in ruins, Tara decides escape is the only option. She flees halfway across the country to dog-sit, but the quiet anonymity she needs isn’t waiting in her sister’s house. Instead she finds a knife with a threatening message, a fame-hungry friend, a too-hunky neighbor, and evidence of…a ghost? Following all the rules has gotten her nowhere. And nothing she learned in Sunday School can tell her where to go from there. (Thriller/Suspense from Whitefire Publishing). Dog Tags by Heidi Glick — A former Marine determines to protect the woman he loves at all costs, and yet his own secrets might turn her against him forever. (Thriller/Suspense from Harbourlight Books). Fear Has a Name by Creston Mapes — Journalist Jack Crittendon fights to protect his family from a stalker’s terrifying schemes, investigates a pastor’s mysterious disappearance, and struggles to keep his faith amidst unthinkable fear. (Contemporary Thriller/Suspense from David C. Cook). Deadly Devotion by Sandra Orchard — Research scientist Kate Adams and her colleague Daisy are on the brink of a breakthrough for treating depression with herbal medicine when Daisy suddenly dies. Kate knows that if it hadn’t been for Daisy’s mentorship, she wouldn’t have the job she loves or the faith she clings to. So when police rule Daisy’s death a suicide, Kate is determined to unearth the truth. Former FBI agent Tom Parker finds it hard to adjust to life back in his hometown of Port Aster. Tom’s just trying to keep a low profile, so when Kate Adams demands he reopen the investigation of her friend’s death, he knows his job is at stake. In fact, despite his attraction to her, Tom thinks Kate looks a bit suspicious herself. (Mystery from Revell [Baker]). A Heart Deceived by Michelle Griep — In this Regency historical romance, an opium addict bent on his next fix finds God through John Newton, and to avoid prison for a murder he didn’t commit, runs to the sister of his best friend for help-only her brother is the one he is accused of killing. (General Historical from David C. Cook). The Well: A Novel by Stephanie Landsem — Mara is a desperate Samaritan girl searching for a miracle to save her dying mother, a journey that brings her unexpected joy and a heartbreaking decision. (General Historical from Howard [Simon and Schuster]). In Plain View (Valley of Choice) by Olivia Newport — Annie Friesen has walked away from a successful career to live among the Amish-which turns out to be harder than she thought. (General Contemporary from Barbour Publishing). Pretty is as Pretty Does: Class Reunion by Debby Mayne — Priscilla Slater goes to her ten-year high school reunion with equal parts dread and eager anticipation. Even though she’s a successful owner of a chain of hair salons, she still feels like the ugly duckling. But when she arrives at the reunion, Priscilla soon realizes that her old classmates aren’t exactly as she remembers them. With humor and a just a touch of sassiness, Priscilla finds herself facing her own truth-and she may be surprised at what she discovers. (General Contemporary from Abingdon Press).